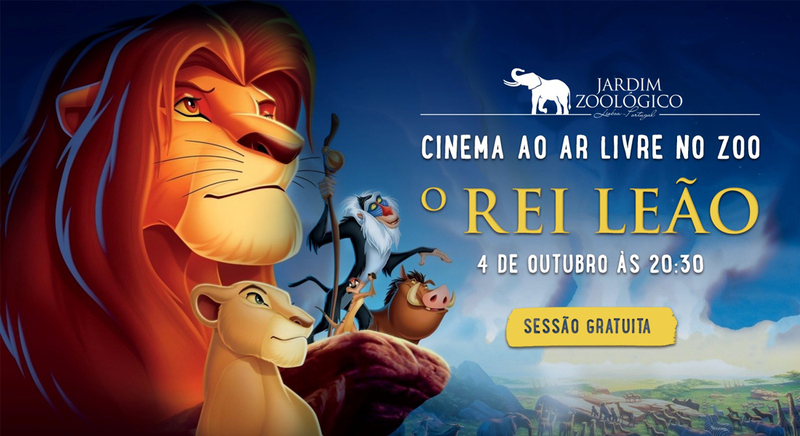 Jardim Zoologico (Zoo Park), in partnership with IndieJunior, invites families to celebrates the World Animal Day on October 4th in an open-air film session. In this unforgettable experience, the kids will watch the Disney classic “The Lion King” – the movie that represents the African savannahs and it’s also a tribute to the animal kingdom. This fascinating movie will be broadcasted in a free session at 8:30PM, at the free access zone of the Lisbon Zoo Park. There are no reservations and the access will depend on availability in the space. But you can guarantee a VIP seat and make this moment even more magical. You have to participate of the promotion “Best Wild Seat” which is running on Jardim Zoologico’s website by October 1st. If you win, you will have reservated seat, popcorn and a special gift. The most wild place of Lisbon guarantee a unique and funny moment. In case of bad weather, the session will happen in a covered space. Don’t miss the opportunity to remember this remarkable story with your family. IndieLisboa Film Sessions are back to London!